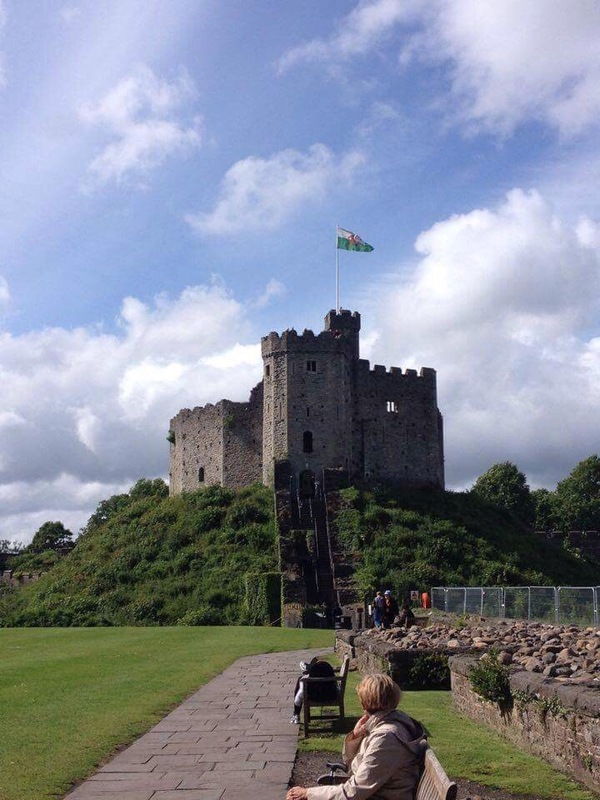 We just got back from a magical trip to Wales. 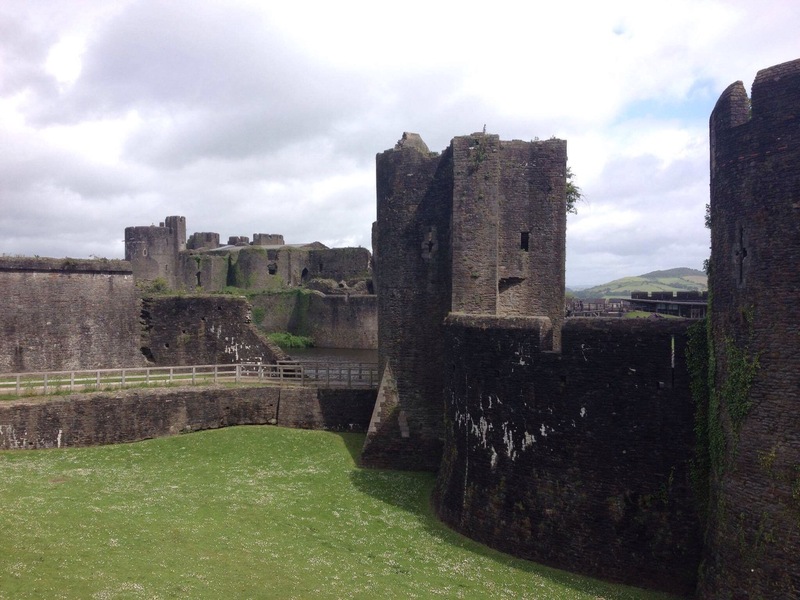 The number of castles scattered wherever we went was incredible. 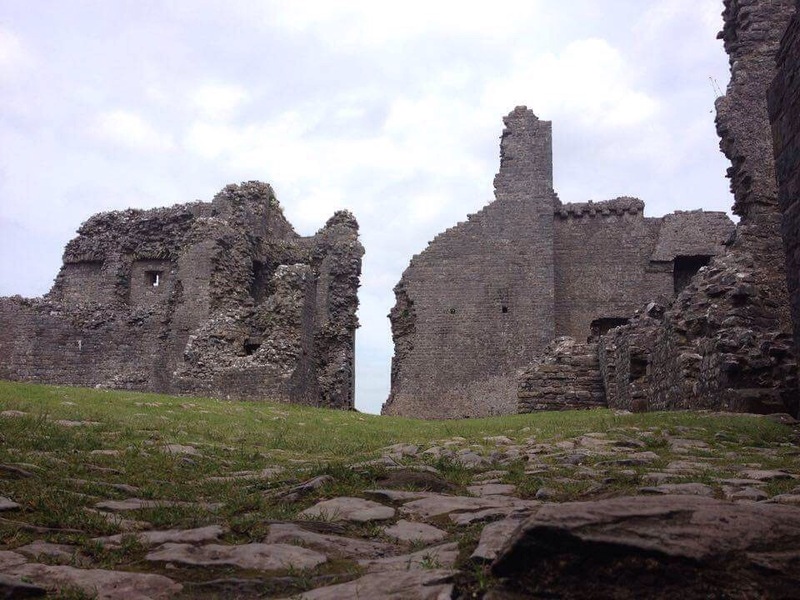 Some in total ruins while others painstakingly preserved to the original designs. All there for people to walk around and through. Down to the deepest cellars right up to the tallest towers and turrets. The coastline is wild and magnificent, the little towns and villages unique and the people friendly, happy and sincere. Truly a wonderful place to visit. 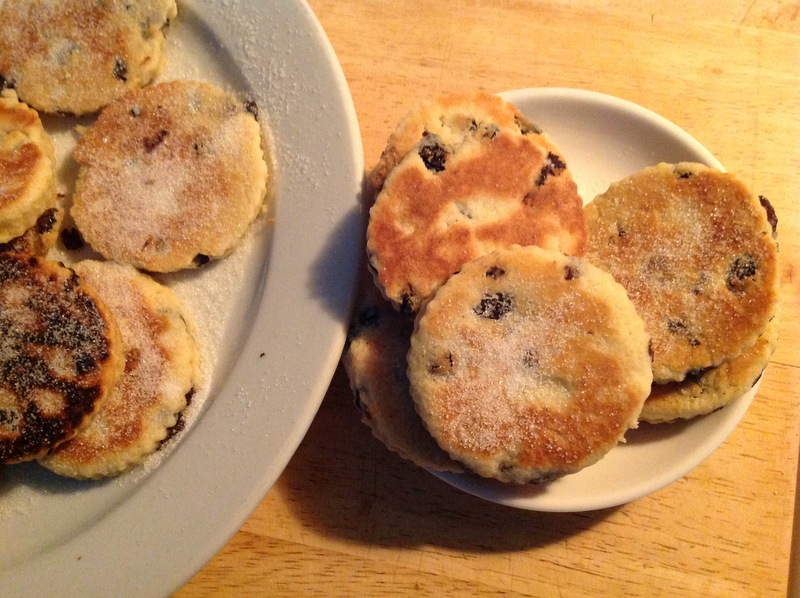 Breakfast in some places consisted of the usual continental and/or a cooked breakfast plus a plate piled high with moist and crumbly sugar dredged Welsh Cakes. In any bakery or cafe and there they were again and in grocery stores in packets of 6 or 8. Honestly, you’d think we’d be well sick of them but noooo….we weren’t even nearly done with them. Sift together the flour, baking powder, allspice and salt into a large bowl. Rub in the butter until it resembles breadcrumbs. Stir through the sugar and currants then add the egg and milk mixture and stir lightly with a butter knife until it all just comes together into a stiff dough. 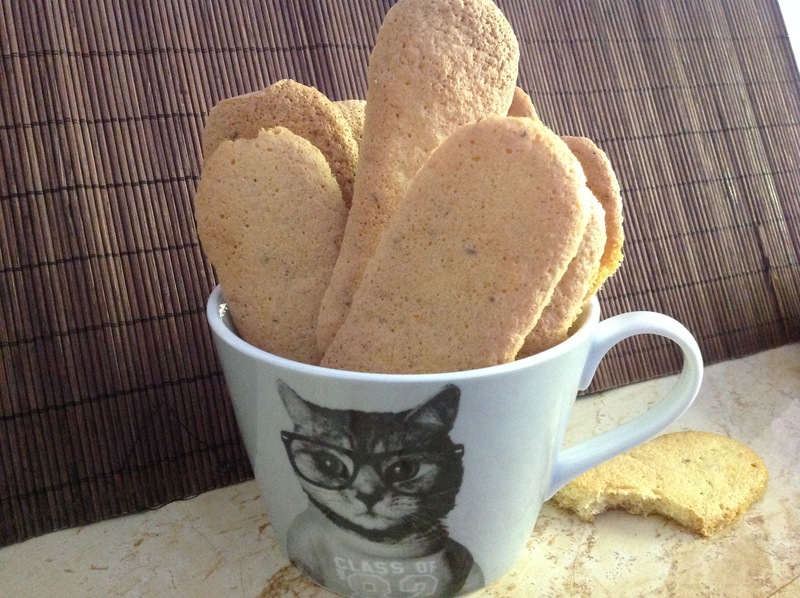 Roll out on a lightly floured surface to a thickness of 1/4 inch and then use a 5cm cookie cutter to cut into rounds. Heat and butter a heavy based frypan or griddle and cook the rounds for about 3 minutes on each side or until they’re golden brown. I’ve been through The Cookbook Guru‘s book of choice for July and August, The Italian Baker by Carol Field, and put in little pieces of paper to bookmark all the recipes I want to try. The hard part is trying to figure out where to start. I’ll definitely be making some of the wonderful breads and trying out the Biga (Starter Dough), but last night I felt like baking some biscuits. 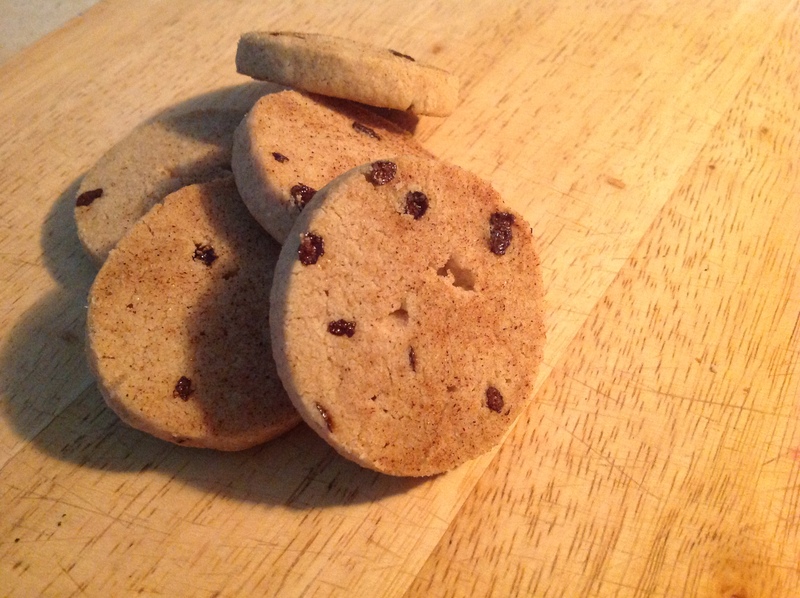 They’re very much like Savoiardi biscuits. So light and crispy with a hint of aniseed. They’re also very easy to make too. 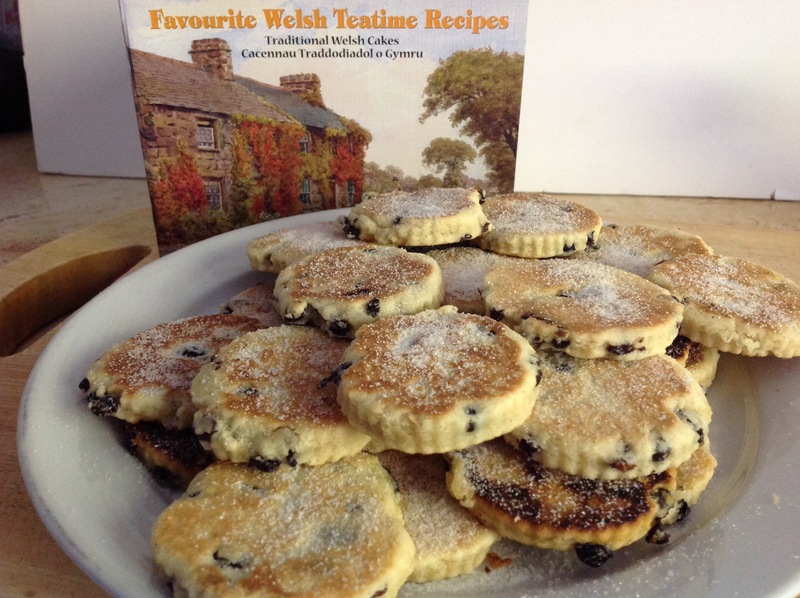 Perfect with a hot cup of tea or coffee. Hard to stop at one…. Whisk the eggs and sugar together until very thick, about 8-10 minutes. Mix in the vanilla and lemon zest then gently fold in the sifted flour, salt and baking powder. Now stir in the aniseed. 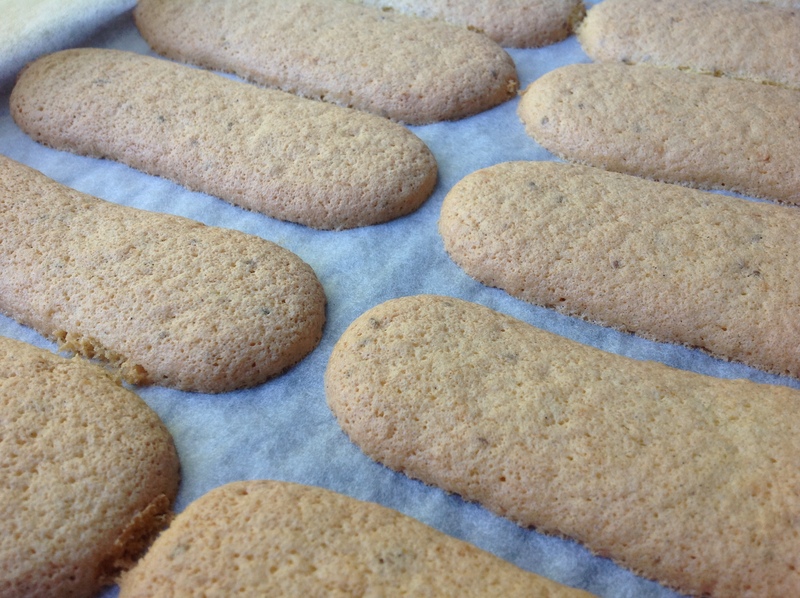 Spoon into a piping bag fitted with a plain 1cm nozzle and pipe 10cm long strips onto a baking paper lined baking tray. Bake in a pre-heated 190oC oven for 20 minutes then turn the heat down to 160oC and bake for a further 5-8 minutes until lightly browned and crispy. Cool on the trays for 5 minutes then transfer to wire racks to cool completely. Personally I’ll be putting in a little more aniseed next time I make these. But then I love the flavour of aniseed. As you near the house all you hear is a familiar sound. The BANG of the Ma’amoul mould being hit on the edge of the table. Yep, it must be nearly Easter and Mum and Dad are elbow deep in Ma’amoul biscuit dough. 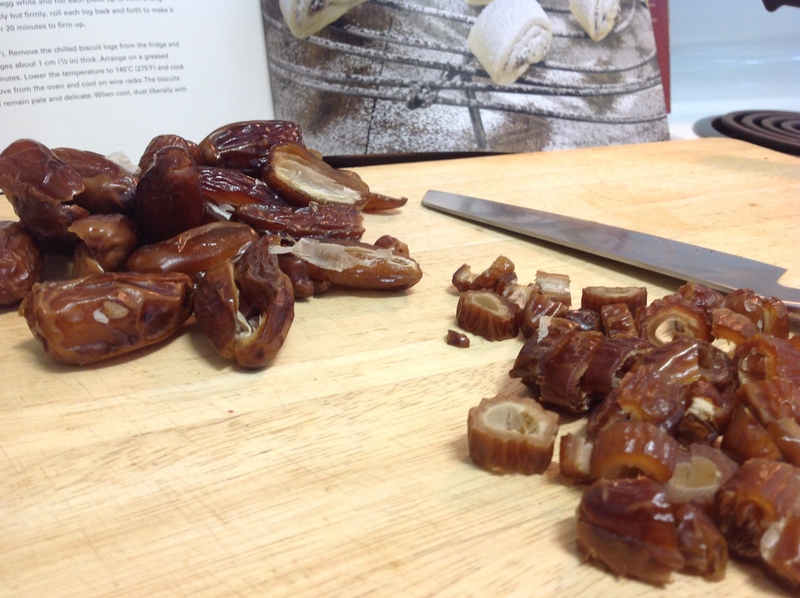 On one side there is a big bowl of date filling and on the other a bowl of crushed walnut and rose water. The smell of melted ghee wafts out the kitchen and invades your nostrils. Only a few more steps and you’ll be amid the organized chaos and within arms reach of this years batch of Ma’amoul. And then you see them…. I’d love to say that is a memory of our childhood but the truth is it happens still, every year. 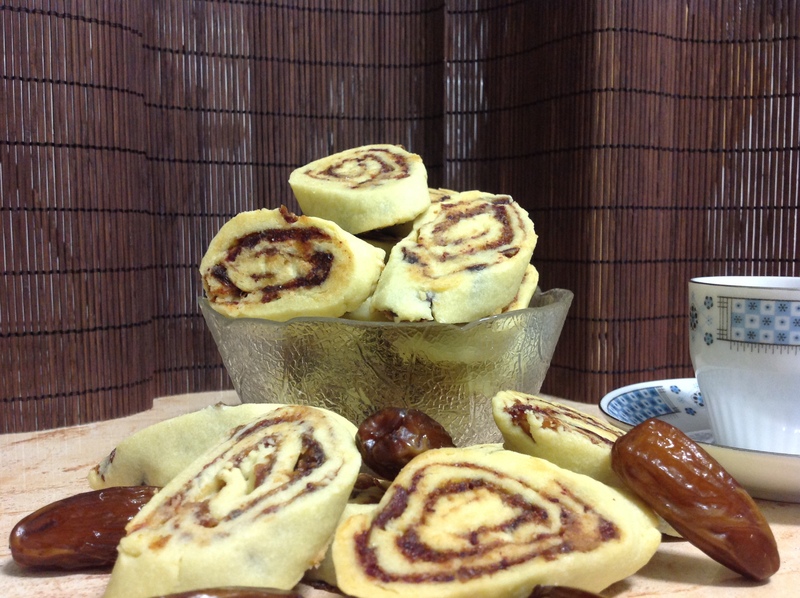 These little gems are quite different to the Ma’amoul we wait for every Easter. 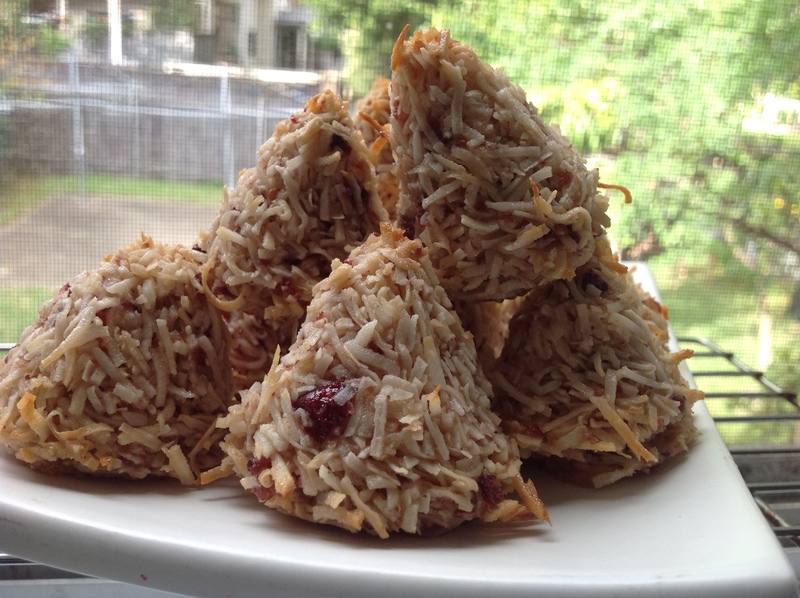 My sister makes something very similar and I could sit and eat a whole plate of them with a cup of tea or coffee. 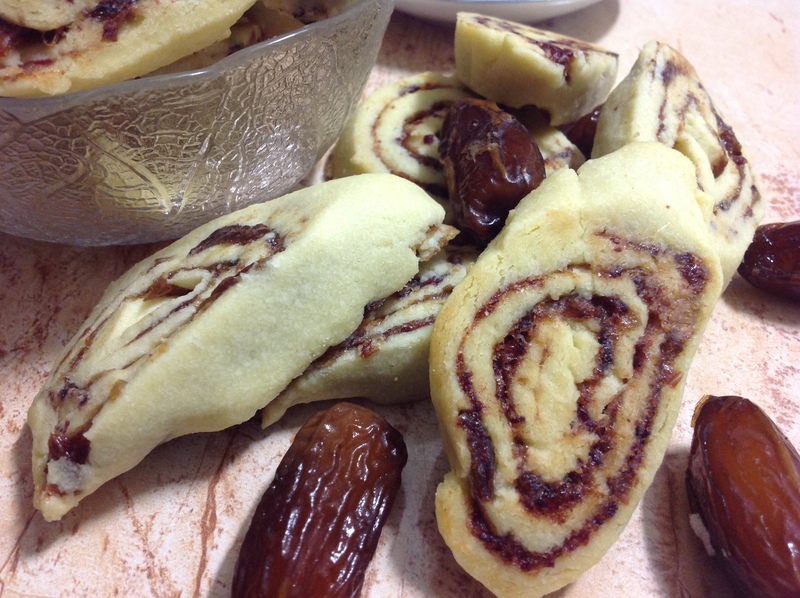 Let me tell you how I made Ma’amoul Swirls from this months The Cookbook Guru‘s beautiful book of choice, Saha by Greg and Lucy Malouf. 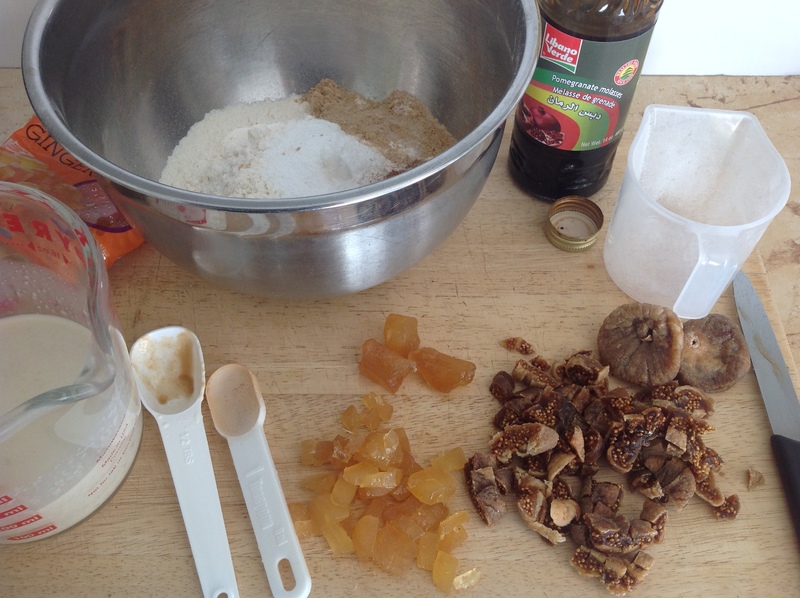 Melt the sugar in the water over a low heat then add the dates, stir well and cover. Leave for four or five minutes to soften then take off the heat and stir in the Kahlua. Leave to cool slightly then blitz in a food processor until smooth. Leave to cool. Rub the butter into the flour until it resembles breadcrumbs then stir in the sugar then add the milk and oil and work into a smooth dough. 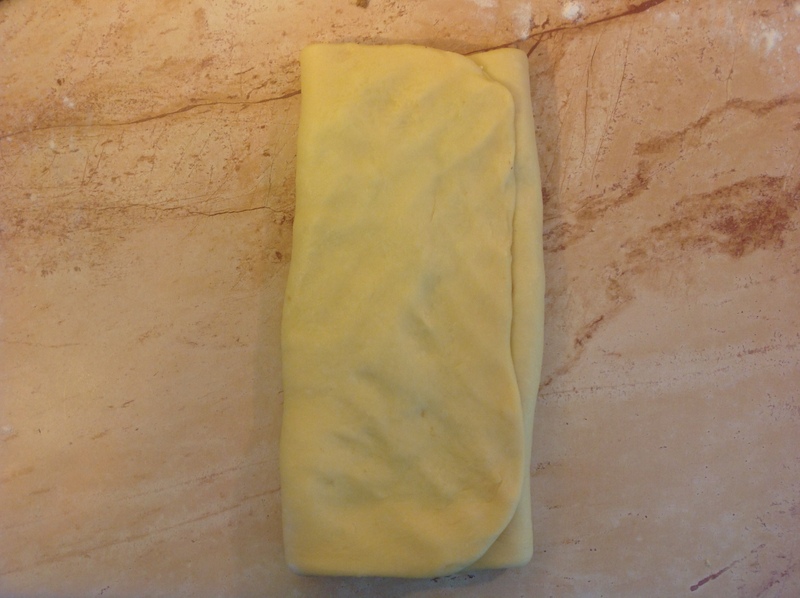 On a floured bench, roll out the dough to a large rectangle, about 3mm thick, and spread the filling over the top evenly leaving a small margin on one of the long sides. 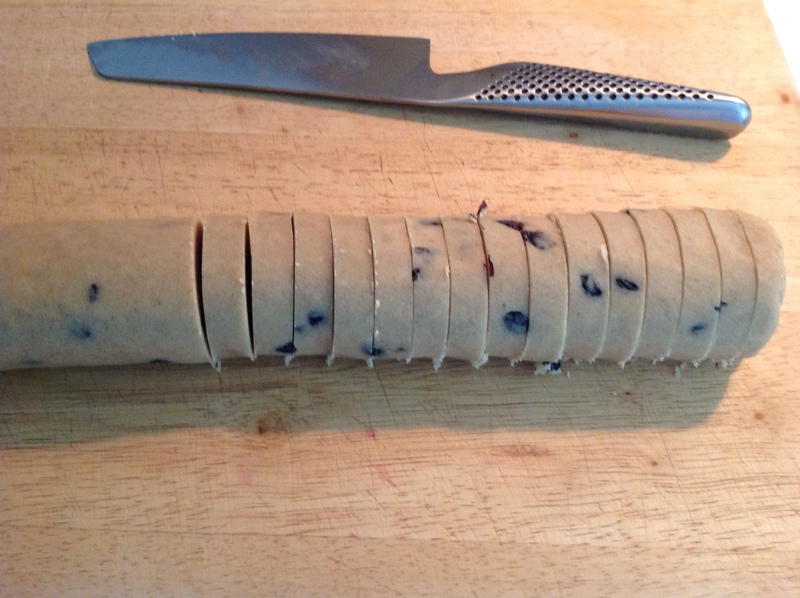 Now roll into a long sausage making sure to seal the edge well. Chill in the fridge for about an hour (this helps with the cutting). Pre heat the oven to 160oC. 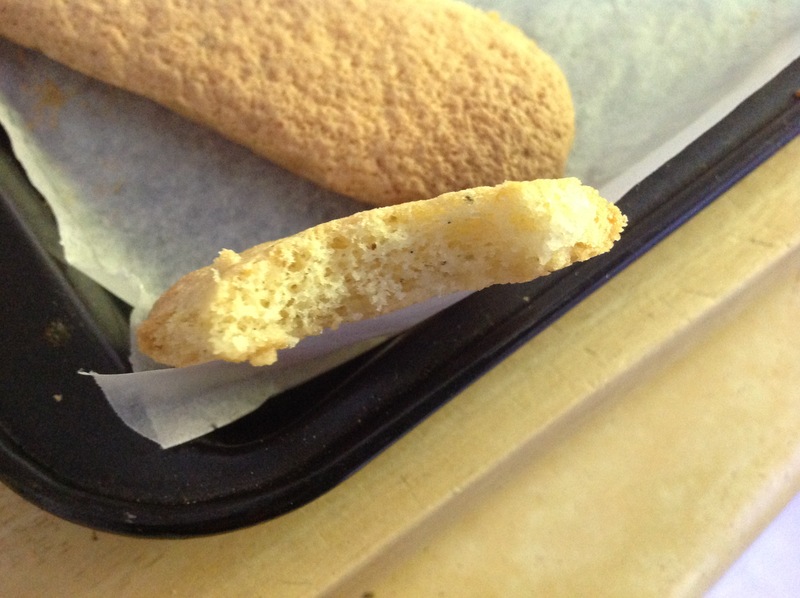 Slice the biscuit log on the diagonal about 1cm thick and place them on a baking paper lined baking sheet. Bake for 10 minutes then turn the heat down to 140oC and bake for a further 10 minutes. 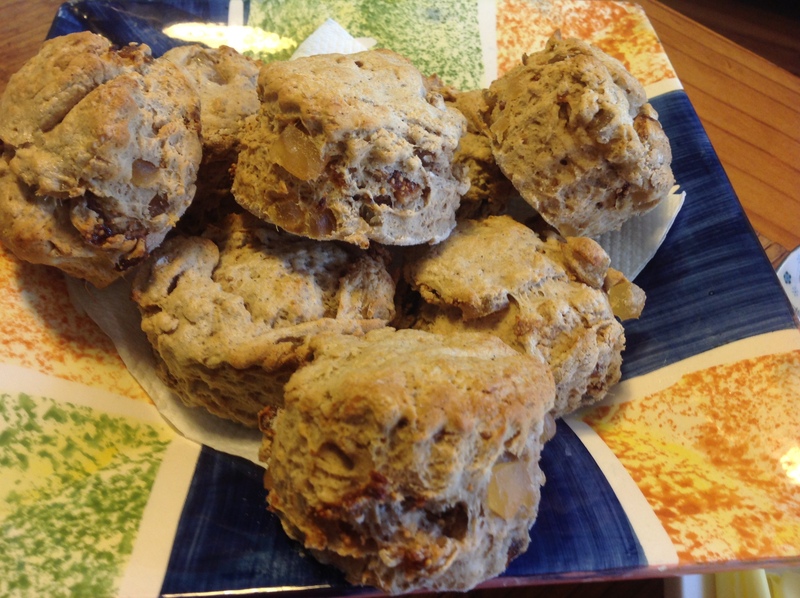 The result…melt in the mouth biscuits. Absolutely delicious…. My sister’s version is rolled in sesame seeds. I’ll have to try that next time. 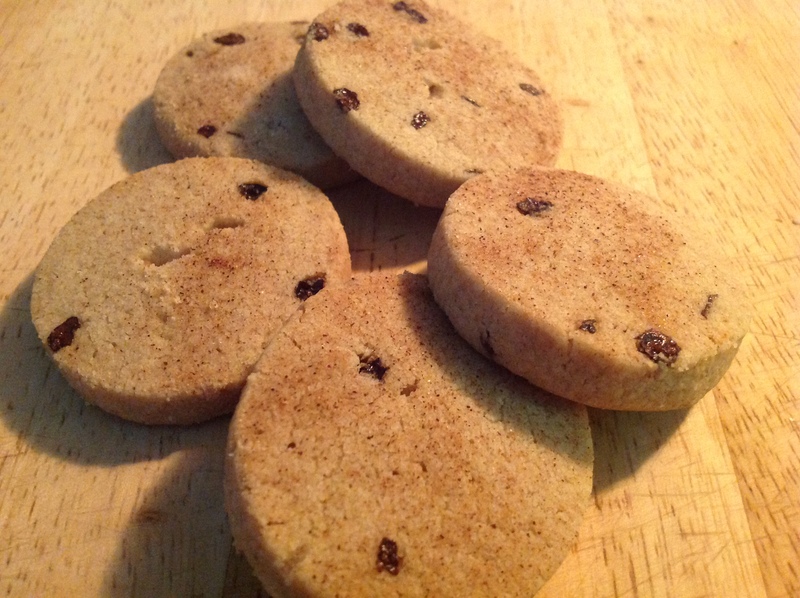 Gluten Free Shortbread Biscuits with Currants. My sister gave me some bags of different kinds of gluten free flours a while ago and while I’ve been experimenting with them I haven’t been blogging what I’ve come up with. I woke on Friday morning with the urge to make shortbread biscuits and remembered the Banana Flour I was given and decided it was time to make a G.F. recipe and post it. 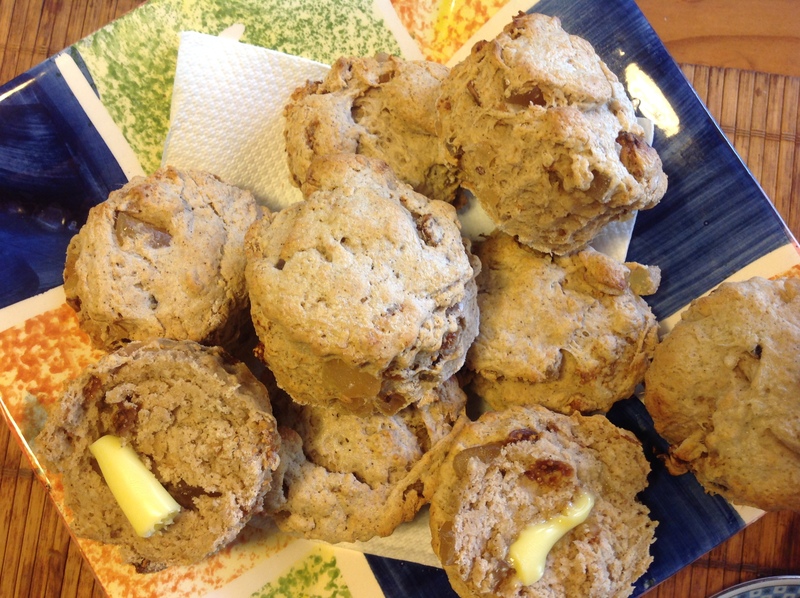 This was the first trial of these biscuits and while they are really good, I didn’t get a big enough hit of the banana flour so next time I’ll be trying a little more banana flour and a little less g.f. plain flour. Of course you could omit the the banana flour all together and just put in 150g g.f. flour and you’ll get a lovely buttery shortbread biscuit. Put all the ingredients, except the currants, into the bowl of an electric mixer with a paddle attachment and turn the mixer on to low speed to begin with so that everything doesn’t fly out of the bowl and all over the kitchen. After a couple of minutes increase the speed a couple of notches and let it mix until it almost forms a ball. At this stage throw in the currants and continue to mix until it all comes together and forms a kind of ball. 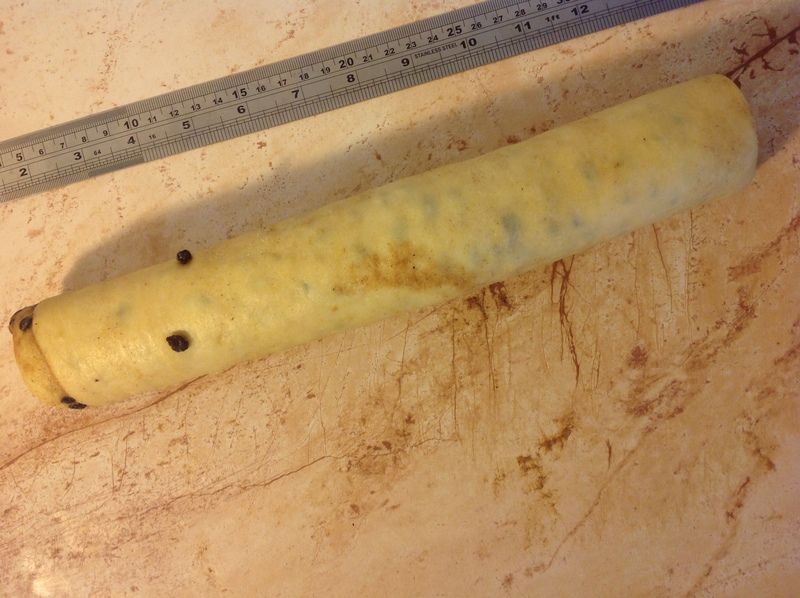 Roll the dough into a long sausage (about 35 – 40 cm long), wrap it in a sheet of baking paper and refrigerate for at least 30 minutes. 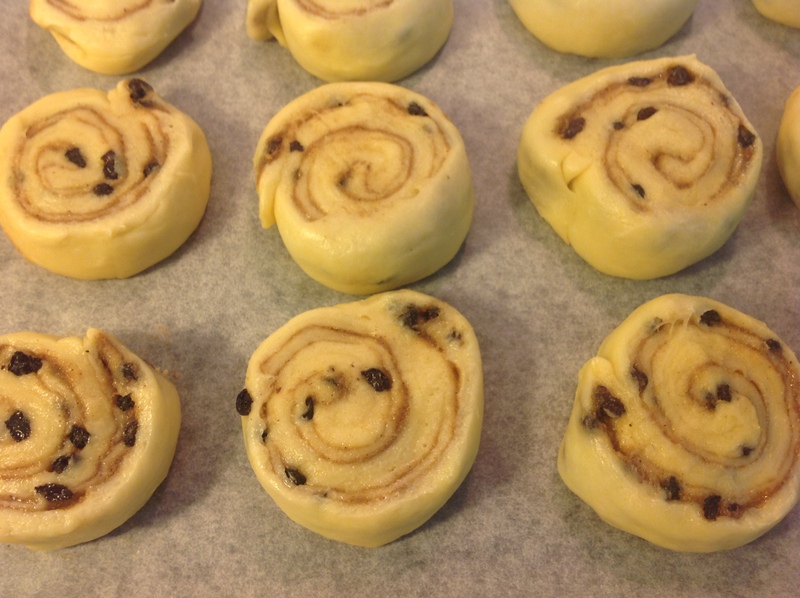 When the dough is chilled and firm slice into rounds just under 1 cm thick, place on a baking paper lined baking sheet and bake in a pre-heated 1650C oven for 25 – 30 minutes or until very lightly browned on the edges. I actually sprinkled a little cinnamon sugar over a few of them before baking to see how they’d turn out. The cinnamon gives it a great lift but that’s just me playing with my recipes again. Leave to cool on the tray while you grab a cup of tea or coffee. The great thing about this recipe is that you can keep the uncooked dough wrapped in plastic wrap for up to a month in the fridge and just cut off and cook as many slices as you need. A constant supply of fresh baked biscuits. I love working with yeast. Mixing and kneading and shaping. The way the dough feels in my hands. It’s very therapeutic. And don’t get me started on the smell of baking bread. It fills the whole house with calm and warmth. Once you have your basic bread recipe you can do so much with it. Adding different flavourings and seeds or herbs. I still haven’t gotten into the sourdough side of things though. A baker friend told me how to get a starter dough going, how to feed it and use it but it just didn’t work for me. Perhaps I’ll try again some day. In fact, I definitely will. 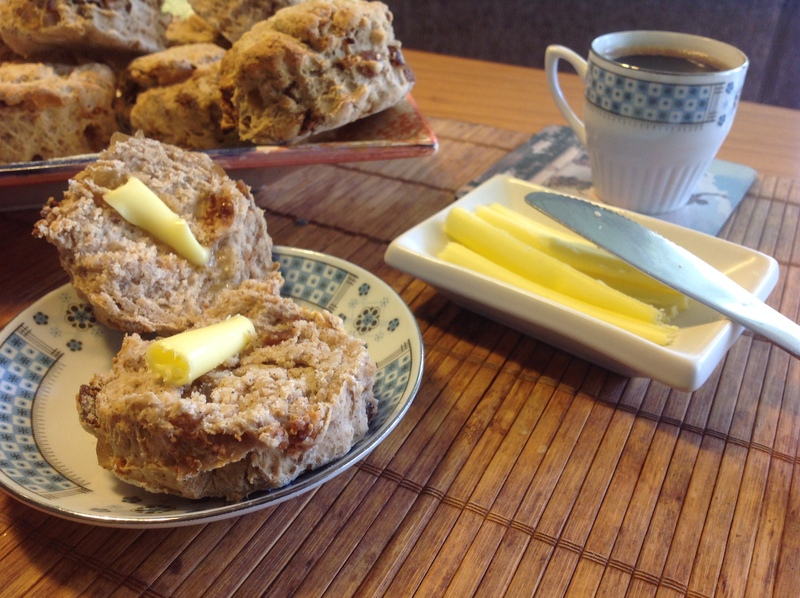 In the mean time, I’ve been going through this months The Cookbook Guru‘s book of choice – Elizabeth David‘s English Bread and Yeast Cookery. There are lots of recipes that take my interest in this book and because there is lots of bread already floating around the house at the moment, I thought I’d start with something sweet. 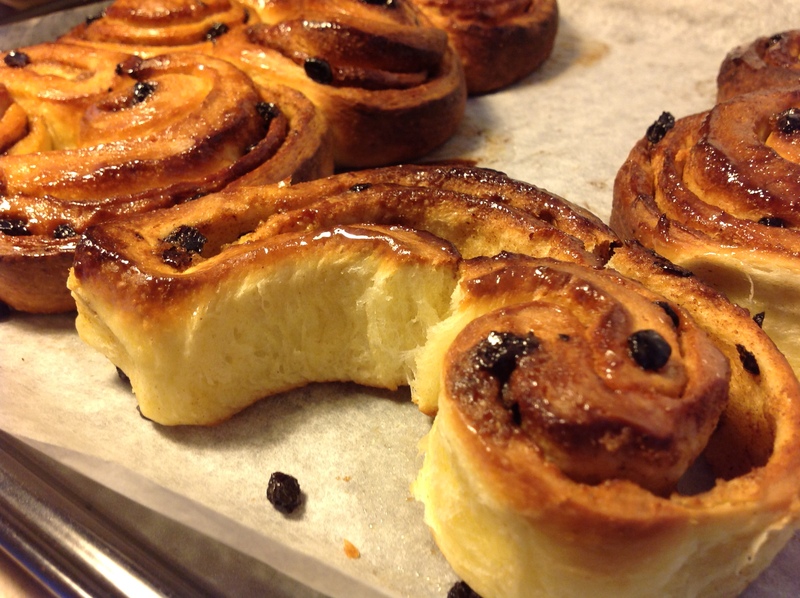 Chelsea Buns are something I have loved for as long as I can remember so why not take this opportunity to try my hand at making them? First batch didn’t work out too brilliantly. I had a hard time getting the dough to rise the first time, so I gave up and put it in the fridge (it was getting pretty late in the evening by the time I did give up though) The next morning I took it out and left it on the bench for an hour to come to room temperature. It’s winter here and our place seems to get really cold so that probably didn’t help with the proving. Anyway, I gave the dough another knead and continued with the recipe. The second prove worked better and the final product turned out okay except I over cooked them. 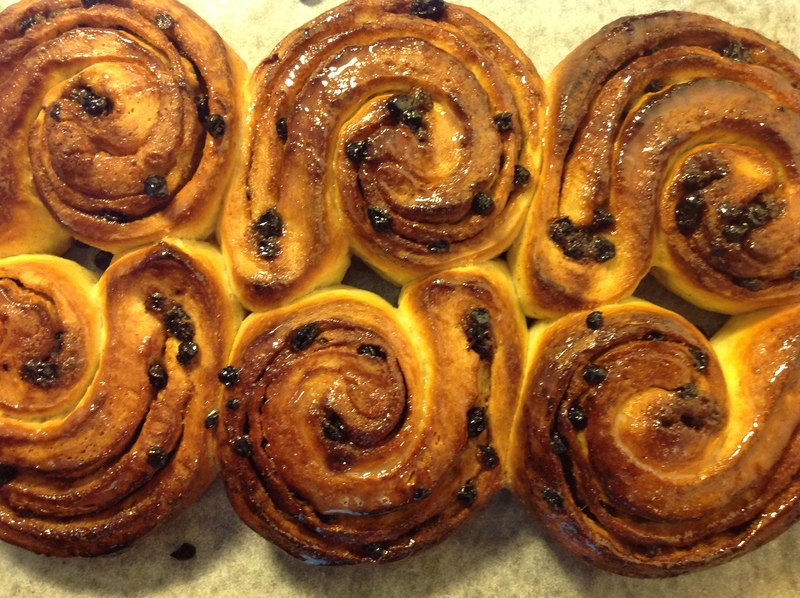 After distributing my near failed first batch of Chelsea Buns to my family I started another batch…. In a small bowl mix together the butter, sugar and spice until well combined. Set aside. Heat the milk to just warm and add the yeast giving it a little stir. Set aside for a few minutes. It should come up all frothy. That means your yeast is alive. Hooray. 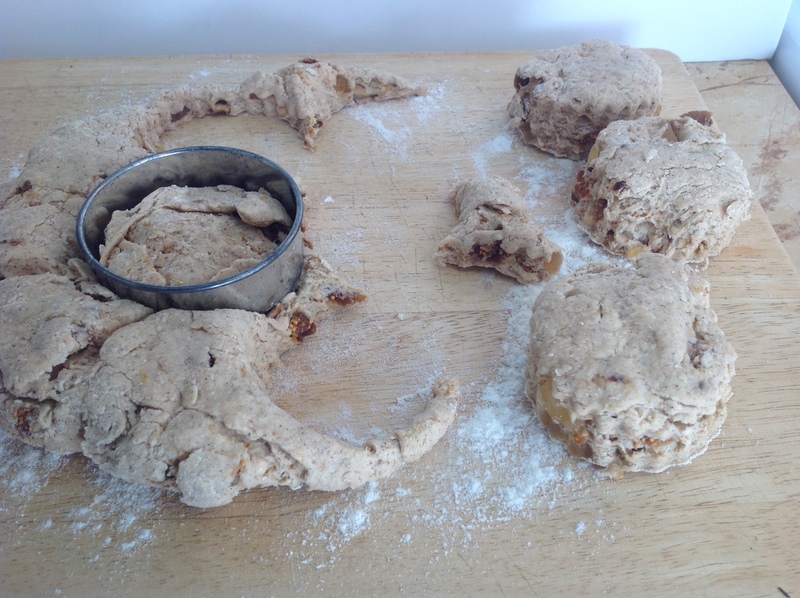 Once it has risen, turn out onto a bench top and give it another knead for a minute or two minutes then roll it out into a rectangle 20cm x 30cm. 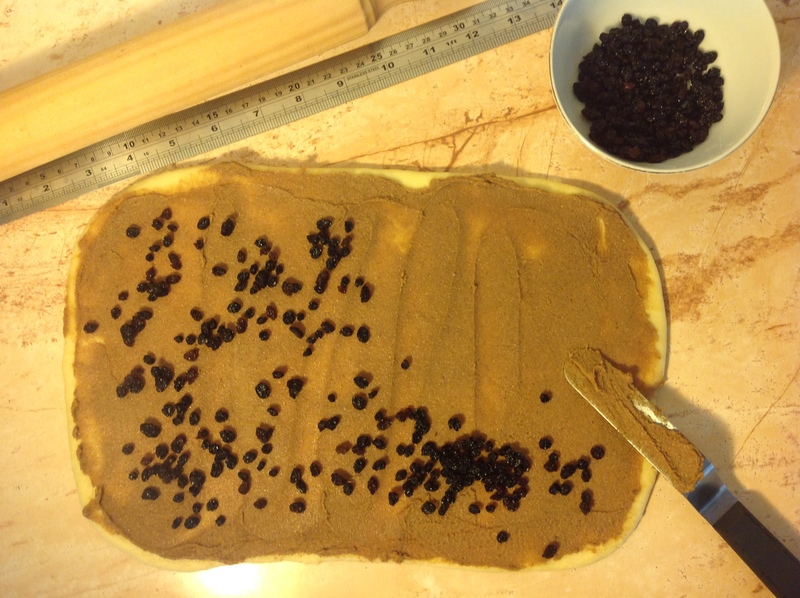 Spread with the butter and sugar mix and sprinkle the currants evenly on top. 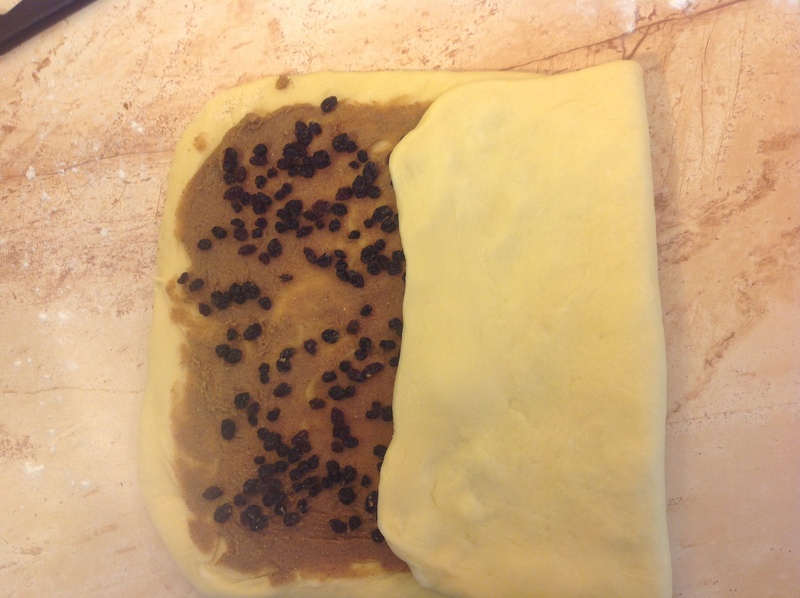 Take one of the shorter ends and fold it 3/4 over the rest of the dough and then bring the other end over to cover this. 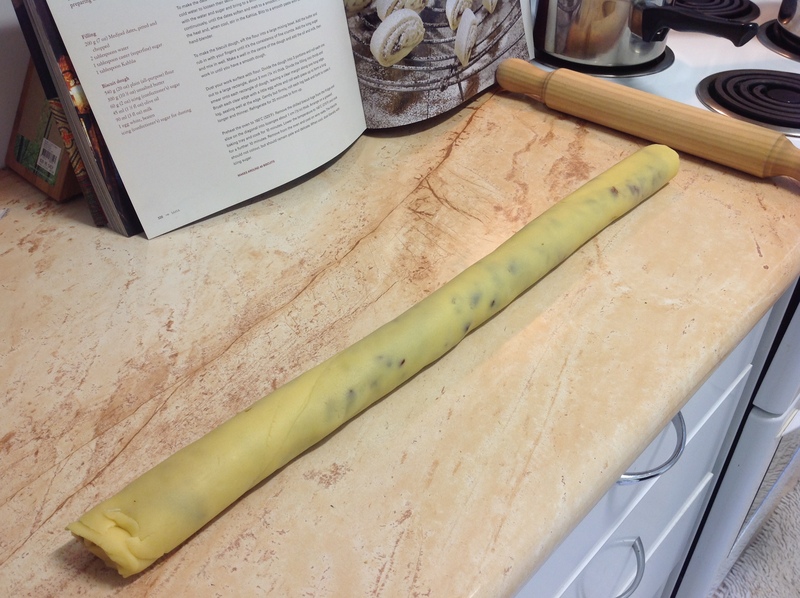 Now roll the dough tightly into a sausage shape starting from the long sides. Cut into 12 equal pieces and place them a little apart on a baking paper lined baking tray and flatten slightly with your hand. When ready, bake in a 210oC oven for 15 minutes until lovely and brown. 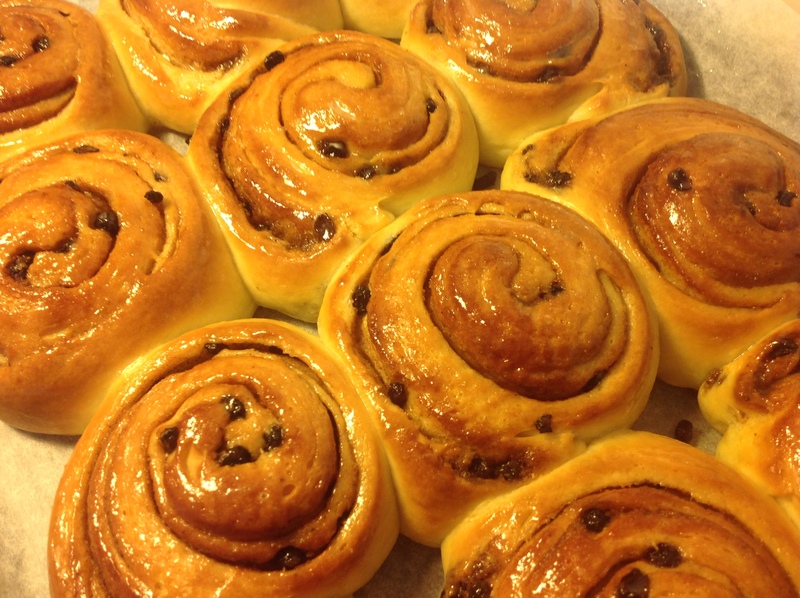 Heat the milk and sugar for the glaze until the sugar has melted and brush over the warm buns. Let them cool down slightly before gorging on them (though I didn’t). It’s just good manners right??? I made a batch of these macaroons for my sisters 40th birthday party on the weekend. They were well received. Several people asked for the recipe so I thought I’d do a blog post and share it with you as well. 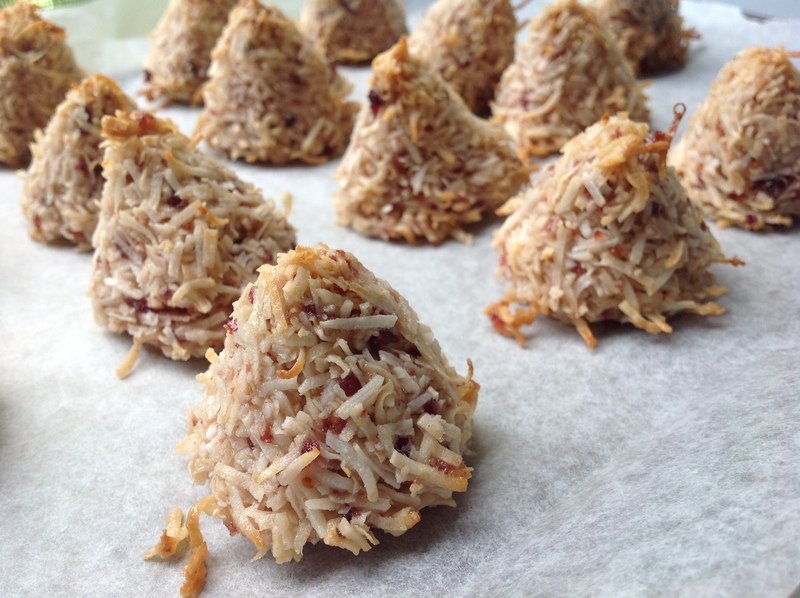 I played with the recipe by adding different ingredients and really liked the cranberry macaroon, though they do taste just as good plain. Just leave out the cranberries and mix all the ingredients in a bowl. 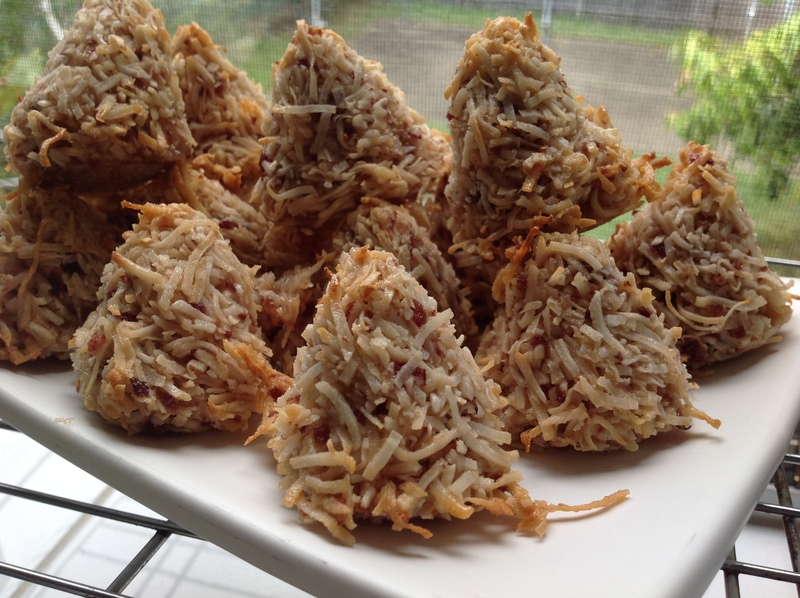 These are very simple to make and look impressive piled up on a serving dish. Blend the cranberries, eggs and vanilla in a blender until the cranberries are chopped up into small pieces. Mix the coconut, sugar and salt in a large bowl. Add the cranberry and egg and mix with your hands until everything is well combined. 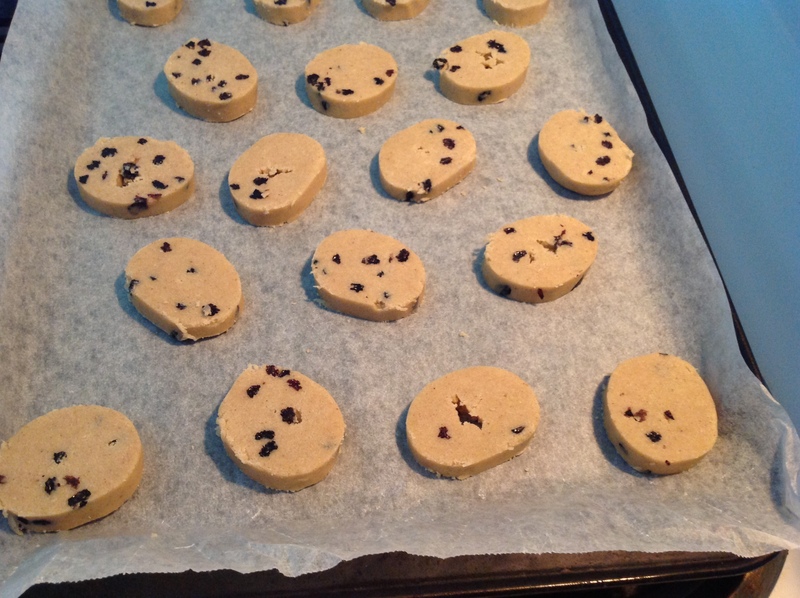 Place them onto a baking paper lines baking sheet and cook at 130C for 20 – 25 minutes or until lightly brown. They store well for a week in an airtight container, but trust me, there won’t be any left to store.